Those look great on you! You’re probably right, it’s the low-waist that made the hook and bar misbehave. I like the dressy button, it’s nice with the pinstripes. I was just thinking, we sew completely opposite things. You make knit tops and pants, two things I never make, and tackle them with confidence. Anyways… stay warm over there! I have used hook & bar on low-waisted things before (successfully), but it was skirts or loose-fitted pantaloons, nothing close-fitting like this. Thanks for all the comments last night! Like Tasia, I think it’s the lowered waist which is to blame for the sliding-down issues. Especially combined with a slippery lining. 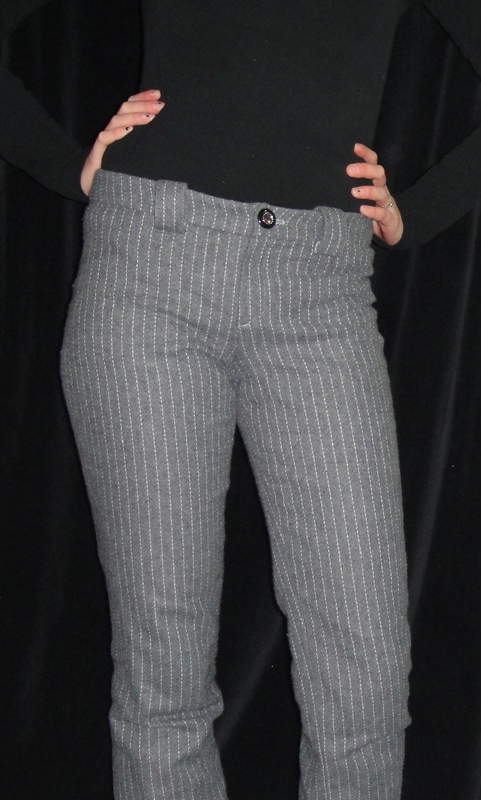 As you know, I love my higher waisted trousers and the fact that they’re ‘anchored’ at the narrowest part of my torso, and as a result don’t need to be very tight at the waistband to stay on, is definately part of the appeal. But of course, it’s not a look which works for everyone. I had another reason to comment though: I know you’ve posted about those back pockets before, so it’s likely someone wrote this already… In which case you can just ignore the following. It looks like you’ve used lining fabric for all of the inside bits of the pocket. Usually, when making any kind of bound pocket, you use the fashion fabric on at least the top bit of the pocket piece which will be attached to the top part of the binding (many seamstresses make that entire piece out of fashion fabric). With a bound pocket, you will always see a little bit of the pocket inside between the welt and on trousers, often more. 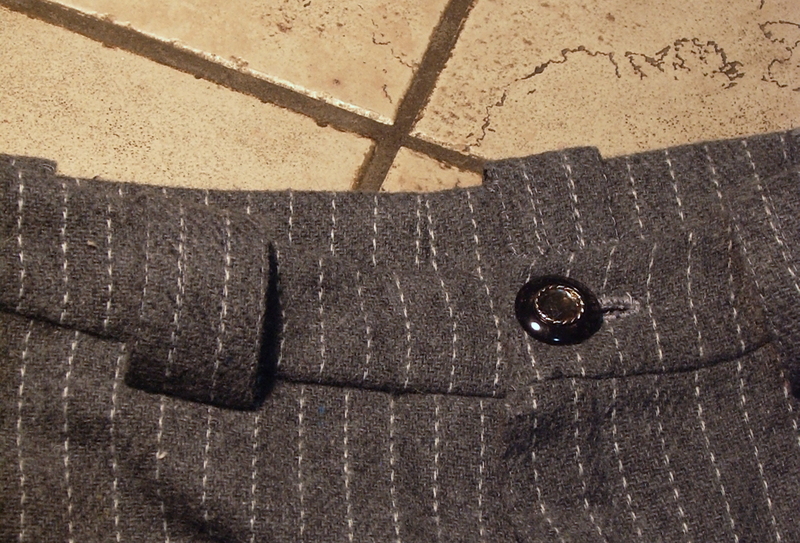 Also: On trousers, I like to make button hole under the pocket opening. You have to do that mid-way through the construction of the pocket because it has to go through the outside and the pocket piece attached to the lower binding. With a button on the other pocket piece, you can close the pocket and keep it from opening up too far when you sit down and staying like that. Yeah, I actually discovered that first little trick in those sewing books I bought on the weekend (only a month or so too late…). We live and learn. The hidden button is a neat idea. I have considered adding a visible button after the fact, but we’ll see how ambitious I get. Always appreciate your comments :). You look rocking in your high-waisted trousers; I would just feel like a whale. The button I described wouldn’t be hidden. And, unfortunately, it’s an absolute pain to add it afterwards. I’ve just made another pair of trousers with this feature. Of course, I didn’t think about documenting the process, but I’ll take some pictures of the end result today and will try to explain it in more detail on my blog. Jeans can be very nice to shape what you want to shape. However, I really like these dressy pants, and I think that they fit you really well too. The belt loops defenetly add a little something! Warm is very good :-). But yes, pants do need something to stay up. If you don’t have much hips, or negate them by making the waist so low, your only alternatives are suspenders or belts. Both if you’re that kind of person :-). They look great! I have to wear a belt all the time with pants (I’m a size bigger hip to waist) and I wish I didn’t have to. I’m going to tackle my abandoned pants soon. I like the comment above about adding the button to the pockets so you can close them. I’ve noticed that on a lot of the rtw pants I own.